It’s almost the start of year for some so here’s a few apps you might like to try whether you’re a one iPad class, a 1:1 class or it’s just you and your iPhone and a document camera. Love that there are ways to integrate great apps in your classroom regardless of what devices or how many devices you have available in your classroom! I wish I’d found this app at the start of last year! You can quickly and easily find appropriately leveled content for young readers. Either scan the ISBN barcode of a book or search for content by title and/or author to appropriately level and store that content based on your in-classroom experience. If you use this app in your classroom, I’d love to know how it goes! Update 2015: This app is now call Artifact Book App. You can still find appropriately leveled content for readers and it has other interesting features as well. Artifact enables teachers, students and other readers to search, discover and reflect on books in new ways. The app combines reader contributions and machine learning to uncover the unique attributes of books and turns them into searchable criteria (aka artifacts). Tired of using popicle sticks and want to “kick it up a notch” with a wow factor? This app supports multiple different classes and various options to choose students. Choosing a student randomly will pick any student from the class, and using turn based selection every student will be picked before any student is picked again. Show your iPhone under the doc camera or plug your iPad into the data projector to let students see what’s happening. Whilst I haven’t used this particular app, (the one below is the one I used on my iPad ALL the time & my 3rd graders LOVED it) I thought this was worth mentioning especially because there doesn’t seem to be ads on this one (the one below does have ads – sorry). I used this app all last year with my 3rd graders – they loved it – me, it was ok, but I found the ads annoying (they pop up ALL the time, not just at the beginning) but hey, small world problem for a FREE app! You can create one or more classes/groups. Add students to those groups. The App will then randomly select students from the highlighted group. All names will be displayed before a name is displayed for a second time. The background music is very circus-y but you can mute it – the star noise will still occur though. Sometimes, when I needed sort “turns” for presentations, I’d plug in my iPad to the data project and have a monitor be responsible for pressing the select button. Absolutely LOVED this app – I’d just quietly plug the iPad into the data project (not saying a word) during independent working time and the impact was astounding! It never lost it’s impact (I didn’t use it ALL the time). Gave us the opportunity for a brilliant visual discussion about graphs during math time too! Hope you find these useful in your classroom especially if you’re looking to slowly integrate technology into your learning environment in meaningful ways or even if you’re just looking to “change things up” a little! I’d love to hear how you get on or what apps you’re using at the beginning of the year – please leave a comment! Next post will be apps for the teacher – I’ll be sharing all the apps I just couldn’t imagine not having as a classroom teacher. We are currently using 3 iPads in our Grade 3 classroom – and loving them! Wish we had more – but we are making the 3 work for us. Recently, I was able to share some “must have” apps with my colleagues – it’s immensely enjoyable when you inspire people with a few really good apps that are engaging to use and have the potential to enhance learning for the students we teach. By pure coincidence, I stumbled across two educators slideshare presentations (linked inside blog posts from my Must Reads RSS google reader feed). Although I’ve been using many of the apps that both educators mentioned, there were a few that I will definitely check out. I thought I’d share those (and links to the two educators) with you today. Guess what – they’re all FREE too! My favourite kind of apps!! Monica Burns (blogs and tweets via @ClassTechTips) is a Fifth Grade Teacher at Alain L. Locke Magnet School for Environmental Stewardship (which I think is in South Harlem?). Student podcasts about Math created by students at Lincoln Middle School in Santa Monica. These might be a bit too advanced for my G3 students – but some of you may find this app useful for students. There are many fotopedia apps, specific to particular places – check out the National Parks one – it’s gorgeous! Update Nov 2015: Unfortunately Fotopedia shut down it’s app in August 2015. Beautiful nature images – I’m keen to explore this one – although I have a funny feeling that some in-app purchasing will be necessary to get the most out of this app (which will be a shame). Great leaf images – perfect for our Structures of Life unit that’s coming up soon. I know some boys in my class that are going to have a lot of fun with this new app! I can’t wait to use – especially with our Character Unit! This needs to be individualised – and since we only have 3 ipads, I’m thinking that I’ll only use it with students who need this kind of practised reading the most, for a short period of time to see if it gives them the boost they are needing. Now, I’ve always used iTalk (and I LOVE it – but unfortunately our personal devices (aka: my iPhone) and our school devices (aka: my laptop) are on separate parts of the wireless – this means that I can not get my iPhone and Laptop to “talk to each other” over the wireless! The beauty of iTalk is being able to share the recordings without having to download to the laptop. I usually transfer files at home. I’ll be trying out QuickVoice for our running records and for students practising their fluency and expression. I like students to record themselves at the beginning of the year, then again mid-year – reflect and then record themselves again at the end of the year – comparing the beginning of the year recording with the end of year recording. Students are always amazed to hear their improvement. Works especially well with EAL students. Check out Monica’s full slideshare presentation here! There might be some more apps that you’re not using in your classroom yet. Carlos Fernandez oversees the Instructional Technology in Leon County Schools, Fl. You can see his full slideshare presentation here. A multi-device collaboration tool from Universal Mind. I’m curious to see how I can make the “flick of a finger” collaboration between my iPhone and the iPads in the class – I’m wondering what that will do to brainstorming in the classroom between my students and myself? I’ll keep you posted! Produced by the NSW Department of Education and Communities, the School A to Z app brings together a wealth of resources to help parents to understand and support their child’s homework. I’m thinking that this would be a really good app to introduce to my parents – most have an iPad or two floating around the house! Hope that some of these apps might be new for you too. I’m always interested to know if you try these apps out in your classroom and how it goes – so please come back and leave a comment! My previous post Working Together, showed an app that I’ve been using to capture stop-motion on the iPad and/or iPhone. There are quite a number of stop-motion apps out now, so I thought I’d share the ones I know about and what I think of them from a working with students practical point of view. I think that it’s best feature is the iMotion remote app (also free). This is especially handy for the manual setting (when you make those amazing moving character stop-motions). Students used the remote on my iPhone while capturing with the iPad – this minimises the need to tap the iPad when you’re ready for the next manual shot of your stop-motion. Very cool! Overall: Remote feature is very worth while especially when working with students and the need to align everything correctly when animating objects. Really does need the export feature for versatility – I think that makes the $1.99 worth it. Overall: A little clunky with limited features – but ok for a free app if you want to have a go. Overall: Very easy to use, with limited options – good for a free app and to get started with. Overall: Do not waste your time downloading this free version – there are better free ones out there. Last week our Elementary School had it’s annual International Day celebration. It’s a fabulous day where we come together and celebrate our differences and similarities. This year’s theme was One Day One World. Our clever Art Specialists, Paz Molina & Trish Neubrand came up with a mural idea that would ensure that ALL the ES students could contribute too. All of the ES students contributed to a large mural during their art times. As the physical items for the mural were made and added to the mural, we decided to create a special time-lapse of everyone’s effort. It took just over a week for the mural to slowly come together. Using the iPad app iMotionHD we set the iPad2 up each day to capture the putting together of the mural. iMotionHD has a free version and it is good but the paid version allows you to export – so we purchased the paid version – this has been a worthwhile investment as it makes exporting finished projects a breeze! This ensured that each time we captured an art session, the differences in capture were minimal. Using iMovie, all the exported iMotionHD captures were imported in, some still images were added, along with some catchy Creative Commons music called Spring the Swing by Papa_Zulu (found on dig.ccmixter.org). Below is our International Day Mural creation – Enjoy! I just love GO’s – Graphic Organisers. Some might say that I am the GO Queen. I truly believe that they are a really good way of organising thoughts and ideas so I use them in the class all-the-time. 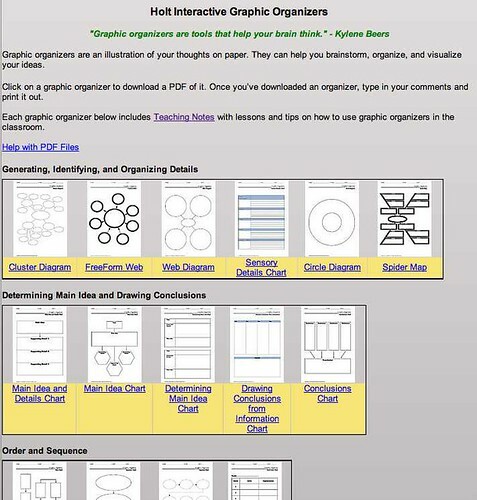 Now I thought I had a pretty extensive list of links for graphic organisers in my del.cio.us account until I came across this beauty of a site listed on Langwitches Links for 2007-11-21 post that popped up in my google reader today. Holt Interactive Graphic Organizers is one of the best sites I’ve seen for downloading GO templates in PDF form. According to their details you can type in your comments and print them out after downloading the PDF file. What really sets it apart from the sites that I’ve collected is the Graphic Organizer Teaching Notes. These are fantastic! All the GO’s are organised into sections stipulating which GO is best for the sort of information or idea you’d like to organise, click on the GO you’d like to try and hey presto – there’s a specific lesson plan for introducing it to your students. Included in the plan are “At a Glance – which I think is close to what we NZers would call Learning Intentions; support for reading, and support for writing PLUS ideas for differentiating the lesson – now that’s handy. I know this is a site that I will be visiting again and again and again.